Phil Hwang’s research interests lie in understanding how sea ice in polar regions changes in the presence of atmospheric and oceanic forcings. He is a co-investigator in the Arctic PRIZE project. The highlighted research questions are how sea ice dynamics (drift/deformation) interact with sea ice thermodynamic (melt/growth), how atmospheric and oceanic forcings influence those interactions, and how those interactions affect the sea ice growth and retreat processes. My approach in addressing the challenging questions is to use combination of sea ice mass balance buoy, upper-ocean profiler and satellite remote sensing. In this way we are able to observe not only vertical sea ice growth/melt (and upper ocean structure) but also horizontal sea ice floe dynamics (e.g. breakup, lead opening/closing). Apart from interesting research works on the desk, I love to be in the Arctic and in the Antarctic. So far six Arctic expeditions were accomplished on board CCGC Amundsen and the Korean Icebreaker Araon. 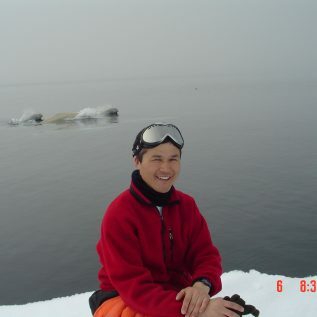 During expeditions, I have gained plentiful experience in snow and sea ice physical measurements, meteorological instrumentation, aeroplane survey and microwave radiometers and scatterometer measurements.